In 2011 BMW was anticipating the growth of fully electric vehicles, and they were developing plans for the eventual launch of the BMW i3 and i8 electric models. However, first they needed to conduct a pilot program to test the technology with real drivers in the field. They came to KBS+ with a plan to lease the ActiveE prototype vehicle in the U.S. and they needed to get 750 drivers to sign up for an (expensive) lease and drive the experimental vehicle for a year. (the Active E was a 1 Series Coupe with a fully electric engine.) KBS+’s role was to design a full experience for attracting and signing up enough qualified applicants so that the 750 cars could be sold. There was considerable concern that American drivers would have “Range Anxiety” about having a car with a 100 mile range before it would need to be recharged. American drivers are used to long distances, and recharging every 100 miles would more than likely sound constraining. In truth, people tend to overestimate how far they drive for the majority of the time, and since their ActiveE would be recharging every night, they would be much less likely to exhaust their battery than it would seem. After brainstorming how to counter ‘Range Anxiety’, my recommendation was to take it head on and provide an tool to allow people in consideration mode, to simulate how much battery they would use in their typical day. This required going back to the client and securing additional funding for a smartphone app, but they felt that it was a strong concept. Developing the concept required numerous clickable prototypes, and working closely with the iOS and Android developers to make sure that the app’s GPS was able to record accurately, and that the app would not exhaust the user’s phone battery. (A situation that would not inspire confidence in the car’s range.) This was a close collaberation between technology, creative and UX, since it was key that we could iterate as the app was developed. 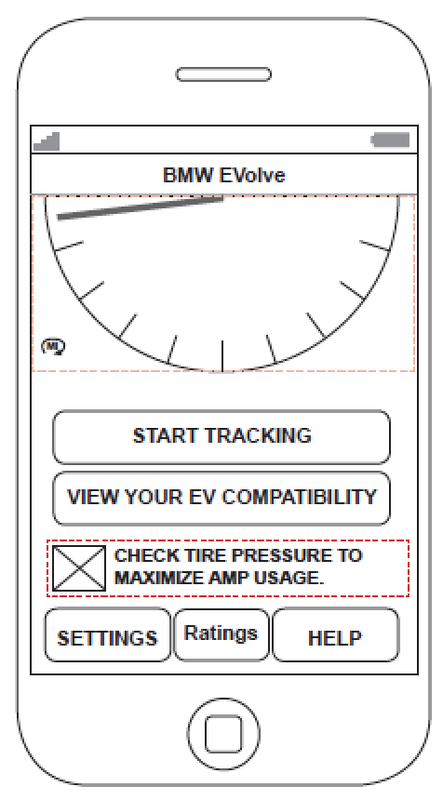 The final app presented the user with a virtual ActiveE battery indicator. 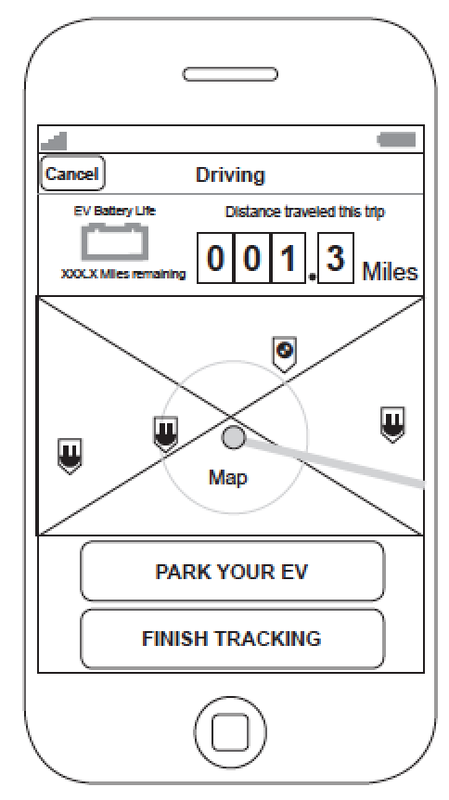 When using the app, the user could switch between 3 modes: “parked”, “Driving” which would deplete the virtual batter based on speed and distance travelled using the phones GPS, and “Charging” which would replenish the virtual battery at the same speed as an actual charging station. The app logged the user’s trips, and would provide a recommendation as to whether their lifestyle was right for a fully electric vehicle. The app was well received, and written up in the press (Autoblog, MotorAuthority), and also was a finalist for the 2013 UX awards. 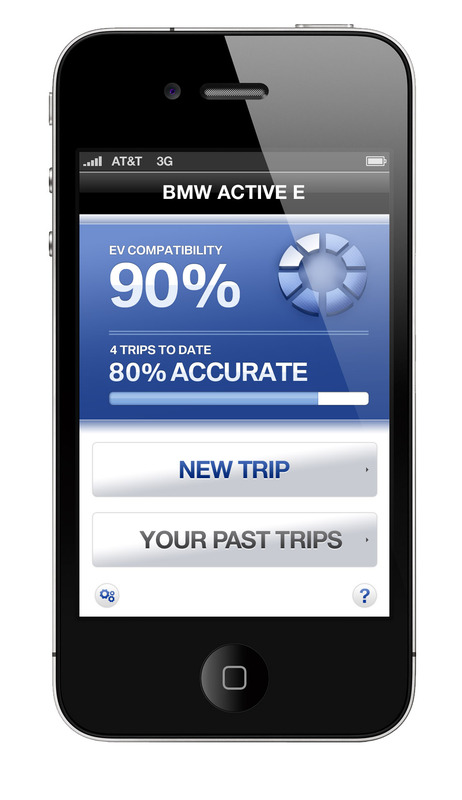 The ActiveE pilot program was a success with all the prototype vehicles leased, and the data gathered was hugely helpful for the BMWi launch in 2014.